In 1991, with almost two decades of experience in the investment and insurance industries, Roger L. Merrill founded Merrill Financial Associates. Today, Roger oversees the operations of the company, supported by two Investment Advisors, and six additional team members. Prior to joining Commonwealth Financial Network® in 1997, Roger was a Financial Representative of the Northwestern Mutual Financial Network (NMFN), and an investment advisor with Hall Real Estate Group, Planned Investments, Robert W. Baird and NMIS. 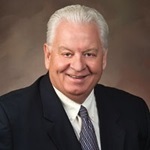 During his 33-year career with NMFN, Roger served as Special Agent, Financial Representative, and District Agent of the Northwestern Mutual Life Orem Utah Agency and was recognized for his work and contribution to NMFN. Roger's career in life insurance and investments services with NMFN gave him exceptional experience in the areas of wealth accumulation; asset management; estate, business, and personal planning; retirement planning; and wealth transfer. His commitment to his clients and his profession, along with his experience and reputation in the insurance and securities markets, earned him a loyal clientele among local and regional affluent individuals and businesses. Since joining Commonwealth in 2007, Roger has been a member of Commonwealth's President's Club. He holds FINRA Series 1, 7, 39, 63, 65, and 66 securities registrations as a Registered Representative and Investment Adviser Representative of Commonwealth Financial Network. Roger is a Chartered Life Underwriter (CLU), a Chartered Financial Consultant (ChFC), and a Certified Retirement Plan Specialist (CRPS). Roger is a 1973 graduate of Brigham Young University (BA) and was a student in the MBA Program at BYU (1974) prior to his career at NMFN. Roger is active in the community and his church. He is past chairman of the Rocky Mountain University Foundation and a past Trustee of The Rocky Mountain University of Health Professions. Roger is a resident of Provo, Utah. He and his late wife, Marva Merrill, have three married children and seven grandchildren. In his spare time, he enjoys hiking, biking, traveling, teaching, reading, serving in his community, and spending time with family and friends. This communication strictly intended for individuals residing in the states of AZ, CA, CO, FL, GA, ID, IL, IN, KY, MD, MI, MN, MO, MT, NM, NV, NY, OH, OK, OR, PA, SC, SD, TX, UT, VA, WA, WI, WV, WY. No offers may be made or accepted from any resident outside these states due to various state regulations and registration requirements regarding investment products and services.